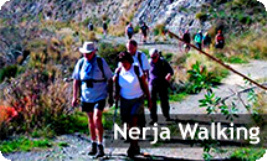 Nerja is an ideal location for horse riding as you can go either into the mountains and beautiful countryside around Nerja or down to the beaches. 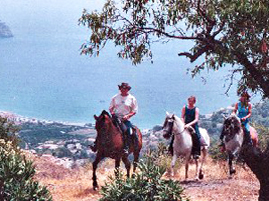 There are several riding stables in or near Nerja and they cater for all ages and levels of experience. These are the riding schools that we know of. They are not recommendations as we haven't been riding with them ourselves, but if you do try them, please let us know how you get on or if you know of any other stables that you could recommend to us and other visitors to Nerja. The centre is run by Gill Russell, a qualified riding instructor, and offers a variety of rides for all ages and all levels of experience from absolute beginner to advanced. Cortijo Hidalgo is the oldest riding centre in Nerja and is run by Heidi and Antonio. There are daily treks into the hills, along the dry river beds or down to the beach and moonlight rides. They also offer other excursions such as longer rides into the mountains of the Sierra Almijara including a picnic lunch or a 5 hour rides up in the mountains past Frigiliana with lunch at a restaurant included. La Herradura Riding Centre is a private, family-run riding school situated just off the N-340, only 10 minutes' drive from Nerja. Rides start from just 25 euros per person and the school is British owned and operated to a high standard. Karen Marshall is the owner and she is a British Horse Society qualified instructor.